Choose from the wide range of Headboards by Exclusive Furniture World. The Doral bed is crafted in traditional French oak style. 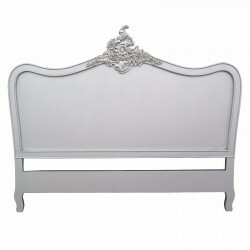 The rounded top gives a delicate sense to ..
French Antique Silver 4ft6 Double Size Headboard Dimensions: &nbs..
French Antique Silver 5ft King Size HeadboardDimensions:H141.5 x W173 x D4.8 cmMaterial:Hardwood + M..
French Cream 4ft6 Double Size Headboard Dimensions: &..
French Cream 5ft King Size HeadboardDimensions:H141.5 x W173 x D4.8 cmMaterial:Hardwood + MDFEAN:649..
French Rattan Vintage Painted Headboard 4tf6 DoubleDimensions:H133 x W141cm (Suitable for 4ft6 Bed)M..
French Rattan Vintage Painted Headboard 5ft King SizeDimensions:Dimensions: H133 x W152cm (Suitable ..
French White 4ft6 Double Size Headboard Dimensions: &..
French White 5ft King Size Headboard Dimensions: &nbs..
French White Single 3ft HeadboardDimensions: H136 x W90 x D5 cmMaterial: Hardwood & MDFEAN:74349..